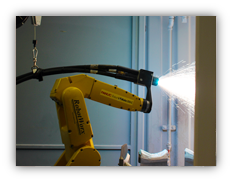 The twin wire arc spray (TWAS) system uses two large aluminum wire spools that are fed to the tip of the gun, then high power is applied, which causes the aluminum wires to arc and melt. 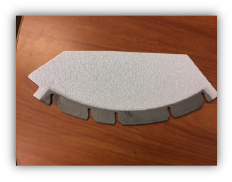 Different parameters are used to get the roughness and coating thickness to the desired levels. 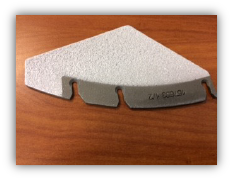 Where grit blasting may allow us to get to 250 – 400 micro-inches, TWAS coatings allow you to get > 1000 µin. 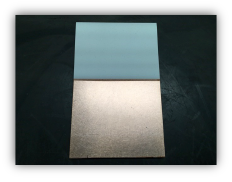 The purpose of the TWAS coating is to increase the part surface roughness (and surface area) to allow better deposition adhesion and to allow more deposition to build up on the part. The goal is to allow the chamber to run full target life between wet cleans which provides better equipment utilization and uptime. 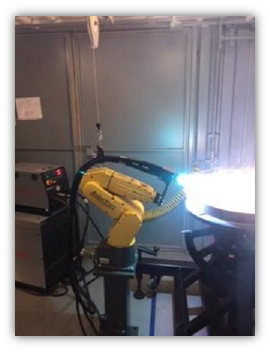 The plasma spray coating provides a protective coating on the part, to extend part life or to provide a high purity surface for better contamination control in the chamber. 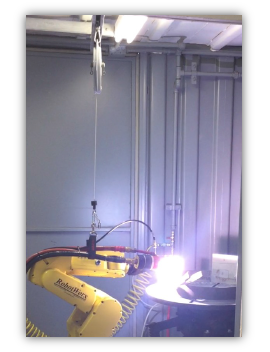 The robot is programmed to provide effective coatings on various parts.